Note: Several people have emailed me lately saying that they’ve tried to comment and have received a screen with a big “X” saying that they’ve been blocked. This is a technical glitch with my content delivery network. Please understand that I have not blocked you from commenting. I’ve even been blocked at times from commenting on my own blog because of this glitch. I’m trying to get the problem resolved. I’m so sorry for the inconvenience and frustration! I’ll try to make this short and sweet. I mentioned yesterday that I wanted to put shiplap siding on my breakfast room walls. I really have my heart set on using some sort of siding in that room. Why? Because that was originally an outdoor area of the house (an open air covered breezeway that connected the house to the garage), and the original exterior of the garage (that’s now enclosed in the breakfast room) still has the original shiplap siding on it. You can see it here painted in a lovely seafoam green. Anyway, because it was originally an exterior area that’s now enclosed, and since the room is kind of awkward, I think cladding the walls with some sort of exterior siding will give that room a story, and will be a nod to the fact that it once was an exterior area. But somewhere along the way I talked myself out of that, thinking that first I’d have to rip down everything that’s currently on the walls (all of the siding and tongue and groove paneling), put up drywall, and then put the shake shingles on top of that. I have no idea why I thought that. There’s no need for any of that. I can simply install these right on top of what’s already there. So after I talked myself out of the shake shingles (simply because of the difficulty, which isn’t really a problem now that I think of it) I planned for shiplap siding instead. I was moving full steam ahead with that plan until a few people yesterday mentioned that they think the look of shiplap siding next to my kitchen would look too casual, country, farmhouse, coastal. One person who agreed even mentioned that a shake shingle look might work better. So tell me what you think? What would work better right next to my kitchen? Shake shingle walls? (I wouldn’t actually use cedar shingles– those are way too rough and hard to clean for an interior application.) Or shiplap siding? With your extraordinary talent either way will be marvelous! Go with your heart. After all, you’re the one who will be living with whatever decision you make. And the rest of us will look at what you’ve done and say “OH WOW”!! !” We always do! What colours are you thinking of as that would influence the look..? They’ll be neutral — nothing to compete with my green cabinets. I’m thinking of using Behr Oyster on the walls (the color that I used on my painted striped floor with the white) and white trim. I think stick with the ship lap and use them like you did with the tiles, you know to off set the formality of the units – you wanted a nod to the original house so why introduce something that isn’t even local to your area? Ship lap, please. I think it will look sleek and clean. The idea of shingles seems more country and rustic, to my eye. Isn’t that interesting? I think just the opposite. The shingles seem more sophisticated to me. I wonder if it’s because of where we live and what we’re used to. We don’t see a lot of shake shingle siding around here, so it’s always seemed very special to me. On the other hand, shiplap siding can be seen around here in pretty much any old house. Is shake shingle siding common where you live? it is so country to me too. Ship lap it. Sorry, I agree. Shingles seem country to me. I like ship lap but it’s all personal opinion. And y’all know you can “upscale” either one in different ways. Do you want the entire house to be formal? If so go with which ever one you think it formal. You’ll make your own regardless of which you choose. me too. I agree go with the shiplap. You mentioned James Hardie siding before but you didn’t like the wood texture. James Hardie does make smooth lap siding and shakes too. I live in the mid-west, and we don’t really use either ship lap or shingles inside much. Drywall prevails! Either choice will turn out fabulous, based on your decisions to date. I agree. I feel the shingles are way more “country” looking than the shiplap. I VOTE SHIPLAP!!! I love the clean, sleek lines of the ship lap. I think painted with a neutral color (as you mentioned in an above comment) that it would look amazing! Go with your gut! You have great style and inspire so many! I like the wider knotty pine that was in another part of the house. Makes the room look taller IMO. Why not paint that green siding the color you are going to fo with and see what it looks like. I like the wood wall,just wish it was about 10 inches wide instead of 4. While, I am not super excited for either option in your house. I agree vertical would look so much better and give the room height. Have you thought about using brick? Maybe z brick? I think I’d go with the ship lap. They both have a semi country look to them but to me the ship lap looks sleeker. I think a lot will depend on the colors and accessories you pick. I’m afraid I personally wouldn’t go for either as I’ve grown up in an environment which was covered with loads of (natural wood) ship lap. But if I compare your inspiration pictures, I still like the ship lap better than shingles. What I’m thinking is: Why go with this idea anyway – only because it was once part of the house? If you followed that idea more closely, then wouldn’t everything in your house need to be painted seafoam green again?! If you can think of another solution for your breakfast room, I would recommend something else altogether (sorry but nothing constructive comes to my mind, though) because I have to agree that both shingles and ship lap do have a country-ish look and feel that clashes with your kitchen look in my opinion. Sorry that this doesn’t help with finding a quick solution, but don’t you think that taking a little more time over deciding this might be better in the long run? I’m pretty sure nobody minds the background in your “big reveal” pictures of the kitchen as we all know what you’re doing and how much you’ve already accomplished! we do not have Ship lap up in the midwest ( the part of the country that they say is the real “country”) so to me Ship lap is not country. I have to agree with Karen. Your kitchen is very sophisticated – neither the ship lap nor the shingles seem to go with that. I’d go with something simple like sheet rock and allow the rooms furniture and accessories make the statement. I agree too. My vote is for “other”. But I’m sure whatever you do will be beautiful. I agree. I would put up dry wall and just paint. I agree. Go with drywall and let the existing wall you like be all the history you need. I agree with Karen. If the only reason you are going with these choices is to “nod” to the original walls, is that reason enough? I also agree that it doesn’t bother us to have a big “ta-da” with an unfinished room in the background. That is normal. Who will be looking at anything other than your gorgeous green cabinets? No one. That’s who. My opinion, in a nutshell… My strong preference is drywall. A distant second is ship lap. Shingles seem way, way too rustic. I agree with Karen as well. Your kitchen is way too formal for a ship lap or shingle backdrop. Just because something was always there doesn’t mean it needs to stay – especially if it doesn’t work within the context of the changes you’ve made. That way lies perpetual and niggling discontent with the final look. If forced to choose one, I would go with the ship lap because it’s a cleaner look. The shingle is way too textural and you’ve already got the textural look of the herringbone tiles in the kitchen. You don’t need to introduce a second textural background. My preference would be to drywall that room. I agree with the ladies who are suggesting drywall. For me, your kitchen is so sophisticated and in my mind, shiplap and shingles are not. 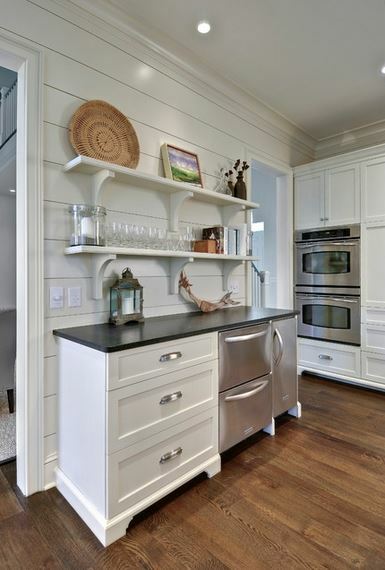 To me your painted floor and shiplap go together whereas the stained floor complement the new kitchen so beautifully. I think I’d “stew” on it a bit before I rushed in to anything. Having said this, go with your heart/gut; in the end we will all be impressed – we always are! I looked at the comments again; I think they are right about the classy, chic style of the kitchen would look out-of-place with the shiplap. Maybe keep the shiplap at the end wall of the room, just enough to add interest? If I were going to do paneling, I would mirror the kitchen cabinets and do a panel with tall moulding in a rectangular shape. But, I know that whatever strikes your heart will come out perfect in the end; remember the brown walls in the living room? (:-)) Go with your heart. Well, if that is the case and your garage had been built of cinder blocks you would have paid homage to the cinder blocks? Just doesn’t make sense to me. Personally I feel dry wall (yes I know you would need to have it done professionally) will, much better set the tone to show off your sophisticated kitchen. But, I could be wrong and it wouldn’t be the first time. 🙂 It’s your home and your vision that counts. While I love the shiplap I think your heart and vision are set on shingles. And I think we will love which ever you do. You see a vision that many of us do not. When you create we are on the edge of our seats waiting for the end result. LOL I think I will love which ever you chose. And I will be eagerly watching to see what your imagination brings next. It’s just my opinion, but to me the shaker shingles give it a costal, casual, country look. .I guess natural stone of some kind would be too expensive? 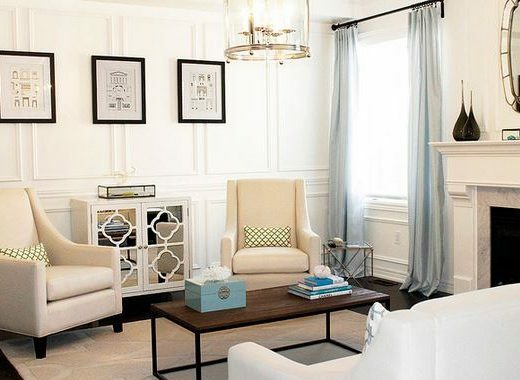 I like the look of the white shiplap in the picture above (not that you’d paint it white). Here I go again. LOL You inspire me so its your fault! LOL Maybe do built-ins all the way across that wall, around the fireplace, to bring that cozy library/dining experience. Oo la la. T’would be gorgeous! OOOOOoooh love this idea! I was on the fence until I read this comment. Shaker is so much prettier, but would compete, unless it were an accent somewhere, either a single wall or some kind of feature, preferably in a dark color (black or charcoal). Then cream/oyster drywall walls everywhere else. The shiplap is ok, but I would think it would have the same competing stripe effect that the painted floors had. The shaker doesn’t look country when it’s dark. While I think the shingles would look awesome, think about your environment. Anything with that much texture will collect tons of dust. If you aren’t in a dusty area, go for it if you’ve been dreaming of it. But, if you hate to clean as much as I do, really think hard on it. It might look great, but will you have to keep dusting if off all the time. Just a thought. Sometimes great interior décor doesn’t equal easy maintenance. I was thinking the same thing on the shingles. Impossible to keep clean and sanitary. You have this fabulous very dressy kitchen. To add shingles to the wall would like wearing a beautiful designer evening dress with a denim jacket. My vote is for dry wall. Such a smart comment. I agree completely. I like the look of the shingles much moreso than the shiplap. However, it may have something to do with that my grandparents’ house had the cedar shingles (in a green a bit deeper and toned down than what you’ve used in your kitchen), so I suppose I have a sentimental pull to them. But, really, that first inspiration piece with the shingles has a larger pull than the shiplap when I look at both photos. Is the current shiplap in such awful repair that you wouldn’t be able to just paint it in your Behr Oyster color and then re-add moulding? Wait…I just went back through posts. It doesn’t go the whole stretch of the room. Blergh. That sort of kills that train of thought. I think shiplap is the best way to go. All depends on how you finish it, but it is an often original wall treatment in an older house. Might not be elegant, but neither is shakes. Shakes gives more of a cottage rustic feel to me so of the two shiplap is less so to me. It can be all different styles. Shakes on the other hand I’m thinking cottage, beach, rustic. In either case though I think it all depends on how you treat it. Smooth, nicely painted and not chips or any rustic feeling removes a lot of the cottage/farmhouse/rustic parts. I, too, LOVE the shingles yet feel it is more of a coastal or country or rustic appearance. Of course depending on the décor in the room. I am voting for the shiplap. As always you will make it look spectacular!! I seem to remember a “I like to make everything a feature” post from last week (ha ha). Maybe you could go with drywall, see how it looks and then do the shiplap if you still think it needs something. I really like the look of that siding that is on there now, if you really must go with siding. I’m from Texas too and the shingles look country to me. In any case, I’m sure that whatever you do will be awesome and if you don’t like it you’ll just redo it anyway! Oh my stars! A fireplace on that wall that you see from the kitchen! It would look so GRAND and draw people into that room. Between the gorgeous kitchen and a FIREPLACE! Use wing back chairs at your glorious table, at least two, upholstered in black and white toile. I am not a fan of toile, however, the black and white in that room would be wonderful. I would recommend something architectural in black and white hung over the fireplace. Maybe an architects rendition of the floor plan, or a drawing of the outside of the house,very lineal. A tribute to the house. A real conversation piece, And leave the original siding. The upholstered chairs would draw people to sit in there, and the fabric would be unexpected. You could have one throw pillow made from the fabric and put it in another room of the house. And it would get them out of your kitchen while you are trying to work. Crazy idea, off in another direction, but inspiring, and you’re stuck…. I LOVE reading you everyday. definitely ship lap, cleaner and neater. You are right the cedar shakes a nightmare to keep clean , You have to go in and vacuum them. My opinion is that they belong on a roof. Here in Western Canada anyway. I think it all depends on the color you choose and the styling you give the room. Thinking of the table you finished for your breakfast room, it seems to me that both options will read country. However, if you were to furnish it differently, it may read more sophisticated. Also, from my own perspective, the shiplap would be more timeless, as opposed to the shake shingle which I would tire of more quickly. I have had my mind opened and have been very impressed by your choices in the past, so this is me giving my food for thought. I will look forward to seeing whatever you decide to do. I have no doubt that it will be fantastic! I’d go with drywall but if not that, the ship lap because it isn’t too busy and rustic. However, the first is a textured, curved wall using square ‘blocks’ set diagonally (officsnapshots.com via Pinterest) and the second, also a wood blocked wall, is an example is behind a headboard. Either application would warm up the space and repeat shapes, patterns you have in the kitchen. The ship lap is so beautiful and clean, while the shingles are way to textural for my taste. It’s not my wall though, LOL. You should go with what you love. I remember reading your kitchen remodel plans and thinking:”wow! I don’t think I’d choose those colors, finishes…” Now that it’s done, It. Is. Perfection!!!! I love shiplap siding, and I think it is just a variation of a simple background that would allow you to layer your look on top of. I don’t think it will look to country’ish, but it depends on the furniture and accessories added to the space that will make the look! I say go for it! Ship lap for sure! All your work looks fantastic and I am sure it will turn out fabulous! What color do you plan to paint after you decide? My vote is for the shingles–especially painted a dramatic color which amps up the already use of traditional materials with a modern twist that you seem to be so good at. It fits with what else you are doing in the house. BTW, whenever you start second-guessing yourself, you come up with AMAZING results (sliding french doors). If you are going to use shiplap siding, why not just use what is already there? Paint it and be done. ?? If I’m not mistaken it doesn’t cover the whole wall, only a little more or less than half so she needs to find something to do for the whole wall, but likes the look of the siding currently on part of the wall. At least I think that’s the hang-up. Because it only covers half the width of that long wall, and I can’t find anything that matches it to cover the rest of the wall. After I went back and looked at the pictures, I could see that the shiplap didn’t go the whole length of the room. I should have noticed that before I commented. 🙂 I think that drywall would be too boring for your tastes unless you would hit it with some very dramatic artwork. I personally like the shake shingle look. My brother is a carpenter, and he uses shakes on many interior jobs. It gives the walls depth. Keep up the good work, and your kitchen looks AMAZING!! In my humble opinion, I love Ship Lap more than the siding. Siding to me makes it look a little like it’s still an exterior wall that the breakfast room was just tacked on to. Does that make sense? If the ship lap was painted white, it may nod to the country look (although i am sure that you could make it un-country! ), but painted any other color (including oyster shell even?) takes the “country” off. You could even end up painting the ship lap with stripes (with colors, or different finishes- one stripe flat, another gloss, etc- or something crazy that I wouldn’t ever think of) and you would make it look amazing! Can’t wait to see what you pick! Are you stuck on horizontal lines? I echo others’ thoughts that shingles are too rustic. I would really like to see a wide ship lap, like in that inspiration photo. The very narrow rows cheapen the look in your current sea foam room, and wide planks would look less busy, cleaner and more modern. Definitely like the ship lap as it can seem more contemporary versus the shingles. Have you considered a painted brick? I can’t remember what your exterior is but if brick then would tie in. Just a thought and I know what ever you decide will look great. I went back to see the photos in your previous posts about the breakfast room. The wide/narrow tongue and groove paneling on the other walls is really unique and gives a nod to the original siding. I think it is more unique than the ship lap siding or shaker siding. I wonder how it would look painted Behr Oyster? With the beautiful table you created and sophisticated wing chairs center stage, adding some type of built-ins to the existing green wall to feature your books, collections and more art from your mom would complete the room. I know you will come up with just the perfect balance. It is going to be gorgeous. I love shiplap siding too! 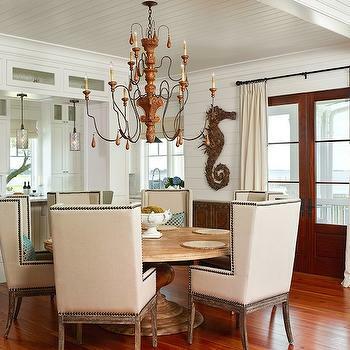 Its only in coastal styled homes where I live but I have seen it dressed up as well as dressed down. If you consider drywall, what about adding board and batten? That should be a snap for someone with your skills and it can look very sophisticated without being la-di-da. I don’t get the appeal of keeping the “once part of the exterior” look. I really don’t. And it doesn’t seem like something that suits your style either, judging by your other projects. Nothing says “add on” like an exterior wall on the inside of the house. So I would stop trying to make this work and just call the drywall guys and make it a nice fresh new room to compliment your kitchen. It will be beautiful! 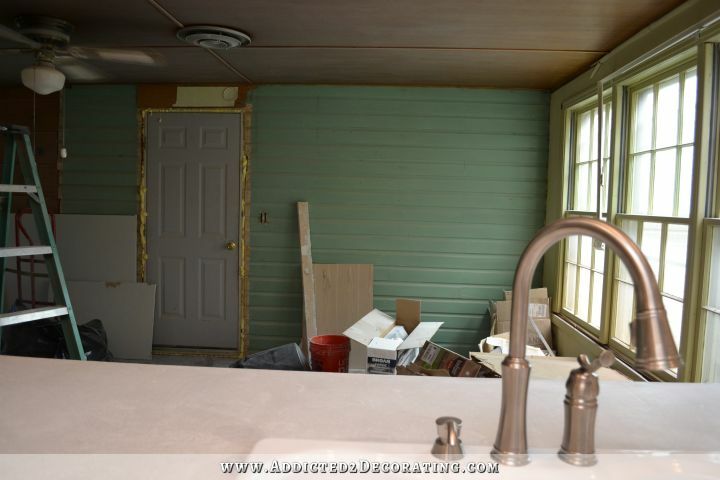 Why not just clear out the area in front of shiplap and paint it color you are thinking of using then stand back and look. Perhaps that small section will give you a feel how shiplap goes with your lovely kitchen. I agree with Jane. If you paint what is up there and stand back, you might get a feel of what the ship lap will look like. I prefer the ship lap for all the reasons you wanted to use it in the first place. I think the shake siding looks a bit too outside for that space. You are doing so many wonderful things in that room, you can’t ruin anything. Personally, I’m not a big fan of either, but I do think that the deep blue painted shake, broken up into segments like that, manages to give it a more “formal” treatment. 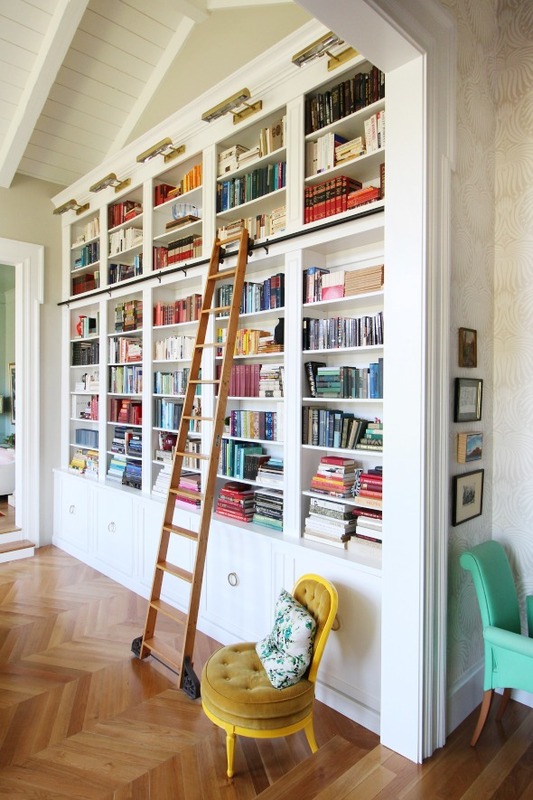 I LOVE the built-in bookcases idea, painted in a neutral color! Use an outdoor patio set (wrought iron) as your “breakfast table” – brings in the outside and hints at being a former outdoor space. Just a thought. Might not be good on wood floors, though. What’s your plan for the floor? I want to carry the same floor into the breakfast room that I have in the kitchen and the rest of the house. It’s solid red oak hardwood flooring. I am with Nancy on this one. Why not paint what is already there and see if you like it..you can always change it later. This would give you the color choice and the appearance and then you can go from there. It appears it is not that big of a wall so why not try that choice first? My thoughts are too much, too much! Back when you striped your floor, it looked so neat, until you paired it with your attention grabbing cabinets. Now, you have green and gold cabinets, and tiled walls. I think the eye needs some calm space. Your table will want to be the star of the room, and with all the texture you have going on in the kitchen I think you should add some amazing trim and have some beautiful art and call it good. Your doors are amazing, your cabinets draw the eye, don’t make the walls compete too. I like the clean look of the shiplap. Nicole? Lol! My husband and dad LOVE to watch her. Me too but I watch for the actual projects. Did you see the episode of Daryl Hall’s renovation show where she visited? We so wanted that to be a great show but instead it was meh. They seemed nervous talking to each other. They shoulda had a beer first. Nonetheless, I think that whatever you do will be beautiful. You have excellent taste, talent and style. wide, not narrow ship lap is my choice. As some others mentioned, a gas fireplace would look perfect. Two thumbs down on shakes…..too busy as would be narrow ship lap. I do soooo admire your abilities and style …. You really hone in on some beautiful design choices (kitchen cabinetry and rolling doors, for example). But why make every room such a statement? Don’t run the risk of the “statements” competing with one another. I’d go with drywall and using artwork to make the statement. But that’s me 🙂 just a thought. I love the shake shingle siding. I was seconds away from recommending that to you yesterday on your post, but I decided that you knew what you were doing, and I like the idea of tipping your hair to the original siding. Now that you open the idea to questioning, I wonder what to suggest.. Would there be a problem to having your kitchen nook look cozy and country? Honestly, despite how much I love the shake shingle siding (I was even considering doing this to my house once I’m not renting), I think in your house it might make the whole area just a tad busy. With your fancy herringbone tile and the shake shingle would just be an amalgamation of busy textures, where the shidap siding would give you a nice contrasting texture. Oh, and I forgot to say that I know whichever way you pick will be beautiful! I am by no stretch a designer, and I like both types. But imho, I think the ship lap will be better. Your kitchen is beautiful and I think the other siding would be too much going on…kind of like the painted floor–beautiful but not the best in that area. But you could do a small section of each and see what you prefer. After all, you are the one living there, not us! 😉 I am sure whatever you decide, it will turn out gorgeous as always! Wow, did you ever generate a buzz with this one. I, too, wondered why you want to use either one since, to my way of thinking neither fit with the style of the rest of your home. Do you really want to confirm that this was an “add on” room instead incorporate the room into the look of the rest of your interior? Also, if I am remembering correctly, this room has the low ceilings and the long horizontal look of the ship lap siding emphasizes the lower ceiling. Having grown up primarily in the south I’m familiar with the ship lap which is commonly used in this area and frequently seen on the interior when an area had been closed in (my grandparents had one on the back of their home, too.) Some readers think it reads “country” and some don’t which leads me to believe that what is considered “country or cottage” varies greatly depending upon which geographical area you live in. Most of the shingles I have seen used have been used in conjunction with stone and its been used in newer homes. I really don’t remember seeing much of it at all when growing up in this area. So, I think you should do whatever YOU want since my opinions were formed by how I have seen the ship lap used and what do I know anyway? It’s hard for me to visualize it with your more sophisticated kitchen (no, I didn’t say “formal”). I’d rather see more of the “Kristi” imaginative solutions that we have come to expect from you. PS. I don’t think it fits with your gorgeous new doors either. Just to throw this idea out… what about a faux stone wall? You have this fabulous very dressy kitchen. To add shingles to the wall would like wearing a beautiful designer evening dress with a denim jacket. My vote is for dry wall. I love the first picture with the shingles! I also really like the dramatic wall color. I think the navy and green would really complement each other. If you used cream or light neutral furniture, you could add some really fun pillows that would tie the two rooms together. I love the shingles personally . Can’t really say why but I do! Shiplap. I love the visual continuity it gives; the shingles are a bit havoc-y to me. I think it might overwhelm the space, but I can’t tell how big the room is from pictures alone. Plus, I wouldn’t want anything to compete with those cabinets! 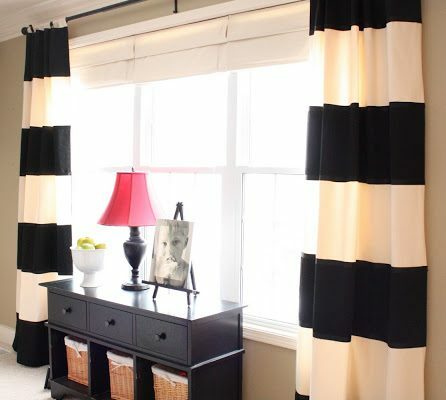 I would put up some dividers or curtains to hide it to do my reveal and focus on it when I’m ready to do the entire room. I think that your kitchen cabinets with all the detailing are too sophisticated to go with either treatment. I know that planked, shingled, and shiplapped walls are all the rage lately but I think it would be way too much and detract from all the beautiful work you have already done. I’m liking the shiplap siding. I’m sure whatever you choose will be awesome! I think you should leave the one wall as is and drywall the other walls. Siding on all four walls will be too much. No shaker shingles. It’s too country for your house. That was my first thought, too. I think the whole room in shiplap would be too much. But the one wall you are showing us from the peninsula done in a narrower shiplap with a large, amazing piece of artwork (or someone mentioned fireplace) would be totally awesome. I liked the picture of the shake shingles in the dark Navy color, but I think just a little of that would go a long way and I personally think it would look cheap and tacky in a pale neutral color. It will be interesting to see what you finally decide on. A thought that just hit me. You keep referring to this room as a “breakfast room” and not a “dining room”. To me the term “breakfast room” denotes a more casual setting than a “dining room”. Don’t know if that is factor to consider or not. I like the shiplap best. I’ve seen it in several new homes lately and loved the look. I like the other person’s wallpaper idea, too. I personally feel like both options feel more country to me. I actually like both looks, but feel like that isn’t the style you are trying to go for in your home. I agree that something more like stone would fit in beautifully with your home and especially nice next to your kitchen. I think the ship lap is simply beautiful and elegant. The shingles do not match the cabinets at all. When you look at the example of the white kitchen with the ship lap the cabinets are like yours and they look wonderful together. Reading through all the comments, I just had to smile to myself. I can just see tomorrow’s post in true Kristi srtyle : ” I have decided not to do either” ……and then you come up with something totally unique and absolutely awesome!!! I think you may be a texture person like me-texture gives me some kind of comfort, a permanence that I don’t get with pretty drywall. However, the shingles are too much for me. I adore the shiplap. I grew up in the midwest in a small town where houses were “decorated” in a no nonsense way. I remember being invited to a friends house in the historic area of town. a one story very small house. I didn’t expect much but inside was white painted shiplap and hanging on the shiplap were antique painted portraits of relatives in large gilded frames. There was an abundance of marble in the bathrooms and kitchen -this was in the 70’s mind you long before anyone would have thought it stylish! I have never gotten that house out of my mind, and although the floors were squeaky and uneven it was the ultimate in “old money” sophistication-or southern I guess, but I had no frame of reference back then. So when others say that your kitchen is too sophisticated for the shiplap, I say “WHAT”???? Your house is too sophisticated for drywall! I think the color has a lot more to do with the “feel” than the type of boards. White definitely feels more coastal, but a darker color feels more formal. Kristi. YOU are the genius here. Go with your gut instinct. I love the siding but whatever you chose will be pure GENIUS! Vertical oyster ship lap, with a black ceiling, will give some visual height and intimacy at the same time. 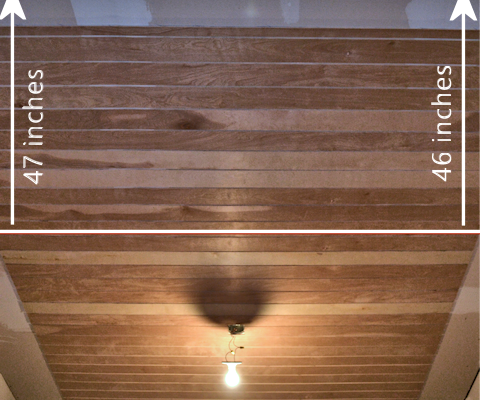 I would do a coffered ceiling with 2×2 lumber instead of 4×4 beams in an interesting grid pattern and add lots of built-ins for storage, books, game etc. in the room, with plain old drywall on the walls. I would paint the built-ins the same color as the trim. This way you add some architecture (and possibly take the eye away from the awkward slanted ceilings), get plenty of storage which most homes do not ever have enough of, and do nothing that competes with that gorgeous kitchen yet makes the room interesting without adding more huge expense to the walls and ceilings! Having said that, you are quite able and talented enough to make whatever you choose look inviting!! In searching for pics of shiplap and shingles in a non-country setting, came across this chevron floor butted against straight wood. Thought you might like it. Ok, ultimately I think you need to go with what makes YOU happy. However, with that said, if you look at the picture that you posted (the Charleston Beach House), I think it looks crazy classy. So unless you’re planning on going ultra distressed, my non-professional opinion is used shiplap. It will keep with what is already in there and I’m confident that you will pick a color that flows with the kitchen perfectly. Also however you decorate in there will also help “classify” the room. Shiplap!!! I would stick with what is there already. 1 – It already conveys the backstory of it’s origin as an exterior wall, 2 – it’s much less hassle, 3 – it looks neat and is an interesting contrast to the other rooms, and 4 – it has less nooks and crannies that could trap pet hair, dust, other allergens, etc.! I like both ideas and think that you can make anything work but my personal choice is the ship lap siding. I’ve loved what was there from day 1. I also like that you are giving a nod to the original home and outdoor space. If it’s a bit informal for your kitchen remember that it’s a breakfast room and not a formal dining room. Love reading all the comments and we all know that you will undoubtedly eventually come to the decision that is right for you! I did a google search for shiplap siding interior walls and there were some amazing images! Yes, it can look rustic but it can also look very contemporary depending on what you do with it, paint color, art, etc. I especially love the one with the huge horse artwork. An interesting interview with a designer at http://www.remodelista.com/posts/expert-advice-ship-lap gives some good insight also. The thought that ocurs to me is that you may not want the breakfast room to compete with the “stunning-ness” of the kitchen but to complement it. But I have no doubt that whatever you choose, you will once again knock our socks off….follow your heart! Ship lap. So many practical reasons and esthetically because it’s part if the house it will always feel right. There will be so many other things to be focal points, a simpler texture on the walls won’t compete. Would I be out of line were I to suggest classic dry wall? You have so much going on in the kitchen that I wonder if the eye needs a quieter place to rest? You have gorgeous statement doors, and I think the rough surface of shingles might conflict with that, as might the gilding on the cabinets. I’d like to see an inventive use of color, related brass/gold accents and a focus on your lovely windows. Just another 2 cents in the pot. I love both, but the shiplap would be the more practical choice. I live in the midwest and I have painted wood shingles on the entire exterior of my home. They add great character, but they require regular maintenance. The shingles collect quite a bit of dirt and dust, and they have a tendency to cup and flatten when the humidity fluctuates. Due to the fluctuations, I have to break out the paintable caulk and touch up paint at the end of each summer. I don’t know what the weather is like in Texas, or what the humidity levels are in your home, but it’s something to think about. I’m in the shiplap group! I think the lines coordinate with the kitchen better. Clearly no matter what choice you make, it’s going to turn out fantastic! you think about the casual cape cod homes sided with the shingles, all aged and distressed, it gives you the idea of a casual, country lifestyle. Its a wonderful look, but methinks too casual for the decorating style you’re looking for. Drywall or board and batten. I absolutely love everything you do so I would not begin to give you my ideas. I think you will regret not doing it if it is something you had your heart set on. Once it is painted you will get a better idea.. I personally love the ship lap. Can’t wait to see how it turns out. As for those who say it is not in the same style of the kitchen, I say it is unexpected and isn’t that what makes design fun?? Go for it! The shingles say “north east/west” to me. I think they would seem out of place in Texas. If it were me, I’d go shiplap. I have no concerns whatsoever that you’ll be able to make either look ace with your kitchen though! Hmmmm….if you must do one or the other for this wall, I vote shiplap. To me the shingles look like a wall that was never converted to be an inside wall therefore not finished, is really busy, difficult to clean, anything you hang on it will have to compete with it and it is. to me. very “country” or “coastal” (style vs geography). The shiplap looks sleek, clean and timeless and to me timeless is the key word! I am voting for the shiplap. I like the look it gives your room. Whatever it is, it all comes down to what YOU love when you look out into that room. Kristi, I definitely think the shingles will compete with the kitchen and look out of place next to the kitchen. I’m on team drywall. The ship lap siding is probably my next choice. But whyyyy do you want to overshadow the star? Keep it Simple. With Clean lines. Calm color walls and drapes. It should coordinate and compliment the fantastic kitchen…not compete! just wanted to say your a inspiration..As a woman who has to tackle projects herself I no sometimes you have to put projects into steps that you can manage on your own. With that said, I think that the wall should become a feature walll with the long vertical siding that way it would be a significant part of the room. The rest of the walls should be drywall. If you go with the vertical siding in all of your breakfast room it may be to busy and compete with all the lines that are going on in your kitchen with the herringbone and running bond pattern tiles. I think that the shake will look too busy. I think you miss the details in a room when there are too many busy things to look at. You have amazing taste, I am sure whatever you choose will look beautiful!! My vote is for the “Shake Siding”. I know that with your amazing skills it would look awesome with your kitchen. Will you be putting the siding on the bottom side of the bar area? Since it has a ruff side and a smooth side you can go with the smooth side. My heart goes out to you and Mike and your other pets.They are also mourning the lost of Power. I’m so deeply sorry. Both seem very casual/country to me, but I like the shiplap best. I just keep thinking all those shakes would be a nightmare to dust. I wonder how the shiplap would look turned vertical, maybe just wainscot height with a chair rail? I like the cleaner lines myself, so shaker is out. Cannot wait to see what you do! It will be fab! Someone else mentioned that option, and before reading that comment, I hadn’t even thought of it! My house has Austin stone on the exterior, so it might look just right. Definitely something to consider. I think the shakes demand a lot more visual attention, which may not be what you want in a room directly connected to your stunning kitchen. Ship lap is still a nod to the original purpose of the room without taking over the view. Your Kitchen is truely amazing, to say the least. The Breakfast Room will be too! I have to agree with those who say no to the shingles. Not enough WoW for the room. The Shiplap would work, because of what you will add the room for the WoW…But putting up sheetrock and starting with a blank slate seems to be up your alley. Keeping the history of the room will back it’s own statement, homes have a way of doing that. Good luck and can’t wait to see what you decide to do…. No way to the shingled siding; it is way too busy. The shiplap is perfectly fine. You got this, it will come to you within two days…. ‘Tis a gift to be simple, ’tis a gift to be free. If you wish to have a nod to the origins of the room leave the shiplap garage wall as is, drywall the rest, paint them all the same. That’s the way folks used to do such additions. It was just practical and saved money. You are tired and grieving your beloved Powder and over-thinking things. Take a drive in the country, go walk in a park, have dinner with your Mom, something, anything, just step away and grieve. Then come back to this. It, and we, will still be here. Now that I think about it, the ship lap would look awesome doing them vertically. Have you thought about that? It would not look so country. Ship lap, I think the shingles look too Cape Cod for Texas. Oh my! I LOVE wallpaper, but I had never even considered it for this room. I don’t know why! That’s definitely something I need to think about. Oh my, please choose the shilap. It’s so cool! I think the shingles reek of exterior siding. Over the years, I think the ship lap will have longer staying power and not look out of date. For some reason I equate the indoor shingles look like lava rock from the 80s. Like it’s more of a trend. My opinion, drywall for the breakfast room and something beautiful for the walls. Those shelves you were wanting to make with the korbels, for instance. Please no neutral colors, you’ve got excellent colors in the navy blue chairs and the green in on your cabinets! I love it! Since we were asked our opinion, I would prefer drywall. Your green kitchen is gorgeous and elegant so why spoil what you have going. But if I had to choose something other than drywall, I would go with the ship lap. My fingers are crossed! Maybe even something like this? A thought: reconsider your door inspiration photo you posted from Veranda of the navy wall, for your breakfast room wall? 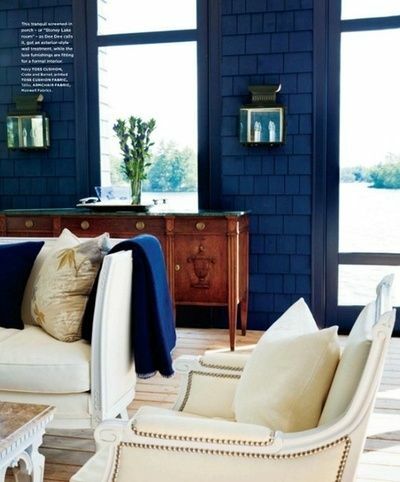 Not necessarily painted navy, but the trim idea over drywall…..(“Oh what a difference trim makes” ?) Looks really “you”, personalized as only you can make it, and definitely NOT country. Still think a bold wallpaper is way to go or perhaps a paint treatment that looks like WP. Stumbled onto this today and the tonal stripes in teal are stunning. I could see something similar in your breakfast room perhaps using the shape of the doors. Big, bold WP or painting technique, etc. Ship lap all the way. Personally, I would probably go with board and batten, to keep with the formal look, but I also like ship lap or re-claimed wood on accent walls. I vote neither one. Less is more and I don’t see either options being the best next to your beautiful kitchen! I vote plain ole’ drywall with some beautifully done built in’s at the end of the room. You could display accessories, artwork, etc…in the open shelving and use the closed door cabinets for storage from your kitchen (or any other junk you don’t want seen). I am sure whatever you do will be marvvvelllous! I love the idea of the built-ins and/or fireplace. However, I’ll go out on a limb here and be the weird one and suggest you use the faux rocks stuff at HD or Lowes to match the stone that is currently on the outside of your house. That would give you the architectural detail associated with an exterior wall, some texture, and a neutral backdrop that wouldn’t compete with the kitchen. Plus, no sanding drywall! I finished too soon….Anyway, I’d use the wonderful shake shingle concept on the back wall of the sunroom when you redo that section of the house. I love seeing that on additions that remain true to the origins of the add-on and celebrating it rather than trying to make it look like it was always there. In fact, that blue on the photo you shared is stunning and would look great with all the light coming through those big windows. Sorry – I’m moving on to the sunroom project way ahead of you. Of course it’s your house and you should do what you want with it but personally I’m not a fan of either option. It reminds me too much of wood paneling which is usually the first thing to go when someone is remodeling. What about beadboard or wainscoting or just plain drywall so that it doesn’t compete with your cabinets? I really like the simplicity of the shiplap siding! I do love the shingle look on the wall. A friend used some of the embossed paintable wallpaper that looked like a bricked wall. It was so pretty. I also love the paintable wallpaper that has a metal tile look. I have done this with copper metallic paint and it so looks like copper. I was thinking, if you make sample boards of the shiplap and the shingles, paint them with your choice of color it would be easier for you to decide which you prefer. Either of the choices could me made more elegant with a gold metallic glaze. Shiplap. It is a clean and simple look. Your kitchen and new french door are very glam and sophisticated truthfully neither the ship lap or the shingles appeal seem to fit with what you are doing with your kitchen… but drywall seems almost too neutral. what about a stone wall made from the “airstone” product at Lowes or somthing like slate? In any case making a major design decision could be delayed until the petite triste leaves the air. Ship lap. I think it is timeless. I know you will make it look like a million dollars. New-be here….Ship lap for sure….shingles too busy for such a large surface. I would want people to oooh and aaah over my kitchen before they noticed the wall. Ship lap is sleek and adds character but wouldn’t take away from your awesome kitchen!